The summer solstice, an excuse to go out for a nice meal with my family. No there wasn’t any sacrificing of goats at hight alters whilst chanting around an open fire, but cocktails, dressing up, pig head’s and amazing food. Yes pigs heads. My Uncle had arranged a meal at The Hand and Flowers, at Marlow, having won two Michelin Stars this year, for select family members and friends to sample the delights on the longest say of summer. And based on the weather we’ve been having it was a nice excuse as we weren’t going to see much of Summer after that. Set in a cosy restaurant, of low beams and large wooden tables with soft candlelight the anticipation of the menu was high. And it didn’t fail to deliver. I love going to a restaurant that when you open the menu the table goes quiet, just everyone is so engrossed in making decisions. Now mama FoodNerd actually always looks at a menu backwards, as she doesn’t want to choose a main or starter that will be too heavy so she can’t manage a delightful dessert. Swears the menus are printed back to front and don;t get me started if the desserts are on another menu! Sorry, some of the pictures are a bit dark but didn’t have time to compose them properly as wanted to get stuck in! 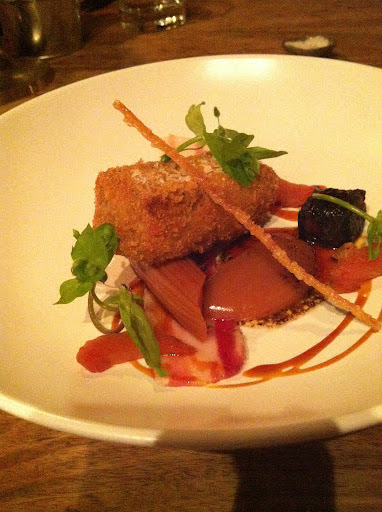 So for my starter, I went for the Crispy Pig’s Head with Rhubarb and Crackling. At first, I was apprehensive as never tried pig’s head before but so glad I tried it. The soft pork was mixed with mustard to counter the richness, then formed and fried in panko breadcrumbs for a great contrast. There was also a rhubarb purée and poached slices which again cut through the richness of the pork and a small cube of sticky rich pan-fried black pudding that working nicely with the dish. There was also a fine matchstick of cracking too which added another pork flavour and texture to the starter- amazing. For my main course, I went for the pan-fried duck breast, with sauté peas and jus, served with duck fat chips, which were the crispiest chips I had ever had, almost mini roasties! The duck was cooked perfectly and the fat had rendered out to leave a fine layer of fat that had caramelised and sticky and simply delicious! So filling as well and well balanced. Now puddings, it was such a hard choice as they were all so amazing! Normally I’m a chocolate fiend, but it was a warm day and thought ‘hey let’s try something different’. 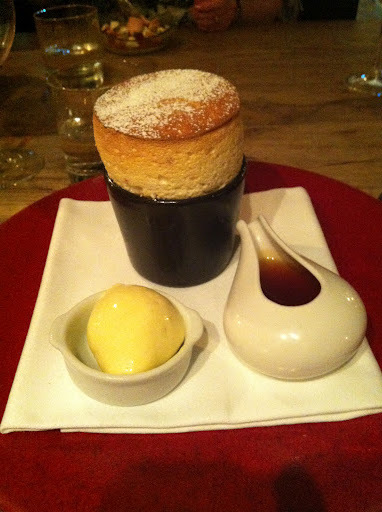 I went for the passionfruit soufflé (made to order) with kaffir lime ice cream and warm toffee sauce. 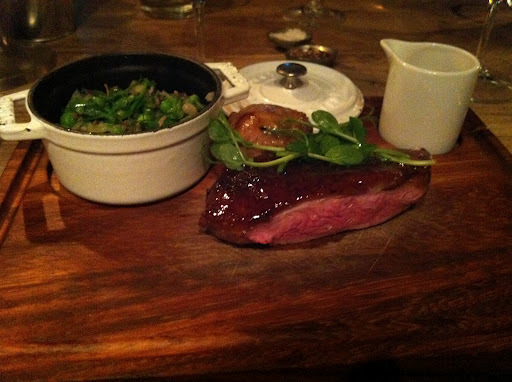 Luckily there was a 15 minute wait for the soufflé so could rest after the beautiful duck. The soufflé was magnificent, the lighter than air soufflé had a good undertone of the sharp sweet passionfruit, the odd seed to have contrasting texture. The ice cream worked beautifully with the soufflé, the fresh citrus flavour lightened the whole dish. The warm toffee sauce was really nice but didn’t feel it needed it really. But overall, a perfect way to end the meal and evening. The Hand & Flowers was a lovely evening with exceptional food and would go back in a heartbeat. Delightful!